What do you get when you have more than 200 children playing in the mud? Let’s rephrase that: What do you have when there are more than two hundred school boys playing with mud? Plenty of dirty uniforms, heap loads of muck and playtime that sees no end: these are probably the first images that would pop into anyone’s head. However, what would have greeted you today at St. Dominic Savio’s High School, Andheri, would be a refreshing surprise! The elements were 200 plus children and clay for each child, but the results were magnificent: more than 200 clay idols of Ganesha! Most of these were on par with the idols one sees lining the fronts of shops and stalls! Our team has often reflected on which groups are most likely to effectively work on issues of environment protection and environmental advocacy. Interactions with schools and neighbourhood groups have convinced us that it is young people--particularly college students--who are most likely to be leaders in this field. So, when we were put in touch with the Ecosophy Association of SIES College of Arts, Commerce and Science (Sion West), we were eager to help them set up their environmental programme. Today, we facilitated the Ecosophy Association's inaugural session, and were happy to see the students' enthusiasm to address environmental and civic issues. But we were in for a surprise! The children responded to the session with the simple idea that since the Earth is our home, we depend on it and we must take care of it. They insisted that none of them want to merely complain about the state of the environment; rather, they want to do something to improve it. For the students of Fort Convent as well as the GreenLine team, today was a day of many discoveries. Fort Convent being among the most renowned schools in the city, we were eager to meet the students and discuss with them the issues of waste management and waste minimization. The very first thing that struck us during the session was that the concerns and perceptions of these students from ‘Old Bombay’ are quite different from those of students in other parts of the city. Since the Fort area is largely clean and well-maintained, we realized that waste is not an obvious, glaring problem and so, the issue may often go unnoticed. For their part, the students were extremely open to the idea that although we may not see where our waste goes, we are responsible for its safe disposal. The children quickly understood that all of us are producers of waste, and that to reduce it, we need to make lifestyle choices that are healthy for ourselves and for the environment. Before you think that the GreenLine team went on a picnic to a zoo or on a safari without telling you, the title signifies the names of the four groups that were formed at the first ever Green Schools Campaign session at Our Lady of Good Counsel (OLGC), Sion. The GrenLine team was happy to meet 65 members of the school's Nature Club. 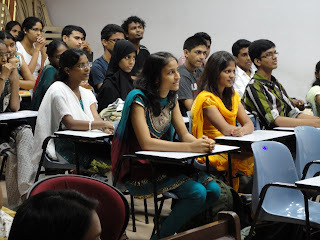 The students of this school--a new participant in the--were attentive and eager throughout the programme. The session began with the idea that Mother Earth is not very different from our very own homes. The students quickly grasped the concept that the planet is a home to all, and it is our responsibility to take care of her. St. Joseph's High School, Wadala -- Living the Greater Life! The GreenLine team reached St. Joseph's High School today for its first session in the Green Schools Campaign there this year, and even before starting the session, what we noticed and liked was the motto of the school -- "I WAS BORN FOR GREATER THINGS". While the motto itself is very inspiring, what really made our day was seeing the bright students living up to that belief. Winners of last year's Best New Initiative Award in last year's campaign, the students participated with excellent levels of attention, responsiveness, and most importantly, the understanding that though the problem of waste management is huge, it is still one that can be tackled. Naigaon seems just the perfect place for an Eco Club – on one hand, it abounds with mangroves, fields, little rives and ponds, while on the other hand, this beautiful landscape is scarred by garbage and potholed roads. No dearth of environmental ‘assets’ or ‘problems’. And that is exactly what the newly formed Eco Club of Don Bosco Naigaon will be focusing on during the next month – mapping the environmental assets and problems in their school campus and in the immediate neighbourhood. As the GreenLine team explained the details of Eco-mapping, the students were quick to grasp the fact that having a good knowledge of the environment they live in, would enable them plan activities for the year ahead that would actually impact their surroundings. Their lively participation made the session extremely interesting and enjoyable.